2015 is not a good year for our family when it comes to health. I’ve been going back to the hospital as early as January and until now I’m battling with my severe psoriasis. I’m not the only one in the family who have health concerns this year and I do really hope that we can surpass this challenge. If you remember my Iskargu post, I visited my grandmother and gave her monthly allotment from my mom and aunt. The following day, I received a text that my grandmother was rushed to the hospital due to unstable BP. I was thankful that I just went there so they had money for the hospital deposit. We are all worried about our grandmother condition and of course for the hospital expense. My grandmother has no health card and we all know that once you reach 60 years old, it is difficult to apply for a health card. Good thing that one of the Senior’s Citizen benefits is “automatic member of Philhealth” + 20% discount. My grandmother stays in Laguna and the nearest relative is me because I also live in South Luzon. 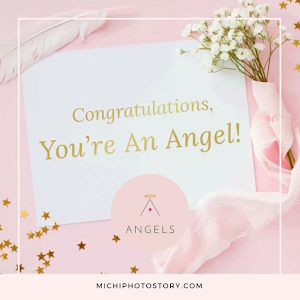 But because I wasn’t feeling well since Sunday and my doctor advised me to rest after my check-up and lab test last Tuesday, I can’t go out and extend my help. But I was really glad that everyone in the family is involved when my Lola was confined in the hospital. But as I mentioned the hospital is far from Metro Manila and traveling just to send money is not a good idea. 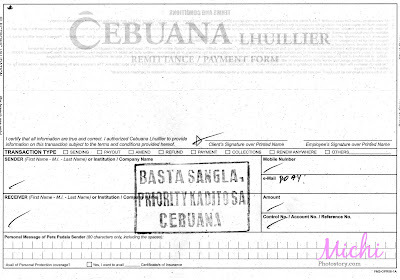 Yes, we can always send money in the bank but one thing that really helped us during the confinement period of my Lola, is Cebuana Lhuillier. 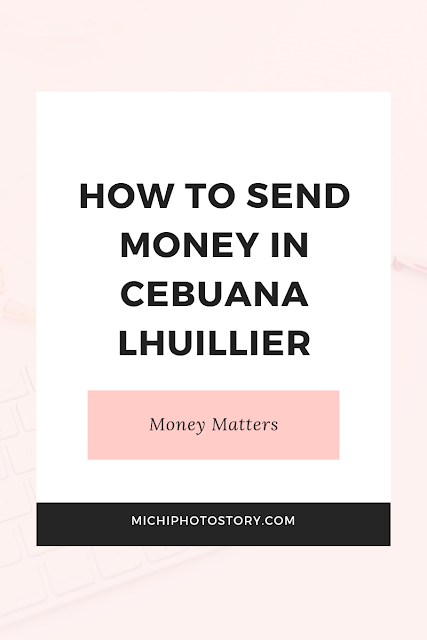 Before, I don’t understand why people choose Cebuana Lhuillier to send money because I always choose online banking to send money, to save time, money and effort. 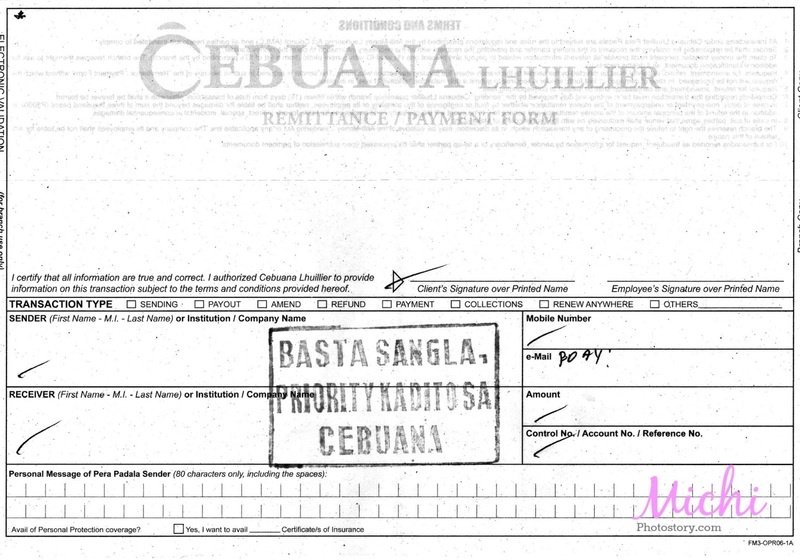 My first experience in Cebuana was three years ago when I claimed a remittance from a relative. My second experience was last month when my aunt asked me a favor to withdraw and send money to her son and daughter-in-law. Then last week September 25, my aunt informed that the billing staff was already asking them to pay more to decrease the running balance. Five days stay in the hospital, bill was 165k+. Waah! September 25 was Eid’l Adha holiday so there is no way to send money through bank. Thank God for Cebuana Llhullier who is open everyday, mapaholiday or weekend. Hehehe! Sending money is easy as 1, 2, 3. All you need is the name of receiver. Make sure that the receiver has valid id. He/She will present it once he/she claim the money. Go to nearest Cebuana Lhullier, get this form and fill up. The charge is depending on the amount of the money that you are going to send. I don’t have the complete list but these were the charges when they sent the money. After that inform the receiver about the tracking number. He/she can go to nearest Cebuana Lhullier to claim the money. Now, I do understand why people choose Cebuana Lhullier because they can send money to anyone who has a valid id. They don’t need an account to get the money. It is open everyday and even holidays. I’ve visited my grandmother last Saturday and Monday and finally after 10 days, we’re happy that my grandmother was out in the hospital. I also hope that you can get over from family health problems. Been using Cebuana too in sending money when I still have my own business. I haven't tried sending money through Cebuana before but it's good to hear good things about them. Hope everythings okay with your family. I hope everything's okay now. 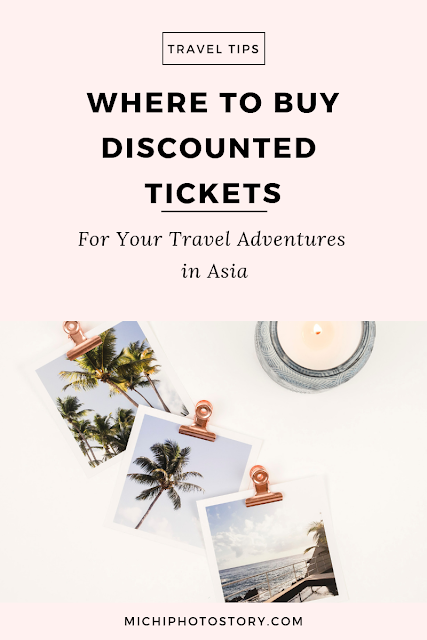 I haven't tried Cebuana yet, but this sure is helpful.